Shaheen, who voted to confirm Pompeo as CIA director in 2017, announced her opposition this week to his confirmation as secretary of state because of "deep concerns regarding Mr. Pompeo's past statements and policy views, particularly in regards to the LGBTQ community, American Muslims and women's reproductive rights." The New Hampshire Union Leader, a daily newspaper in the state's largest city of Manchester that has a history of endorsing right-of-center candidates in elections, called Shaheen out for not opposing Pompeo for anything regarding foreign policy. "Sen. Jeanne Shaheen may withhold her consent for any presidential nomination for any reason," the editorial said. "But the reasons she is giving for opposing the nomination of CIA Director Mike Pompeo to be secretary of state are foolish." "Shaheen says she is concerned about Pompeo’s views on ‘the LGBTQ community, American Muslims and women’s reproductive rights,’" the editorial explained. "She should be concerned about Russia, North Korea, and Iran." 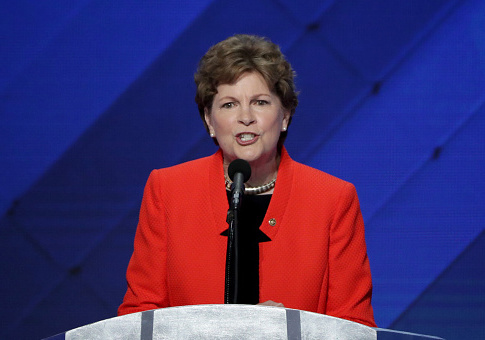 "Shaheen is putting domestic partisanship and left-wing identity politics ahead of national security. That is a lousy set of priorities," the Union Leader continued. "In Congress, Pompeo voted as the conservative Republican he is. As CIA director, he has been a professional, demonstrating his competence and qualification to be secretary of state. Does Shaheen believe that Republican Presidents should be nominating liberals to key foreign policy positions?" The Union Leader concluded by saying Pompeo should be the next secretary of state. "Pompeo deserves Senate confirmation. Shaheen should refocus her priorities,"
This entry was posted in Politics and tagged CIA, Jeanne Shaheen, Mike Pompeo, New Hampshire, Secretary of State, Senate. Bookmark the permalink.